This coffee-colored piece captures the literal and symbolic power of horses throughout history. Sarah Janece Garcia's equine work of art is part of a two-part series of paintings inspired by horses throughout history; view the companion piece, Reveler. 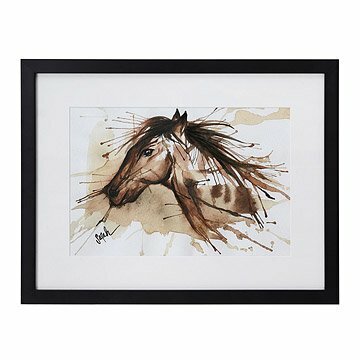 Using only two shades of watercolor paint and a material that has inspired many of history's most creative thinkers--coffee--her piece captures the literal and symbolic power of horses throughout history. Native American tribes revered horses as mythical creatures, and in addition to caring for these majestic steeds, they trained them to work as their partners in accomplishing feats that would result in broadening the tribe's lives in many positive ways. To many, the horse remains a figure of freedom and an echo of the past, and this artwork was meant to embody the timeless qualities and energy of a steed galloping through the wind. Designed in San Antonio, Texas. Printed and framed in Portland, Oregon.